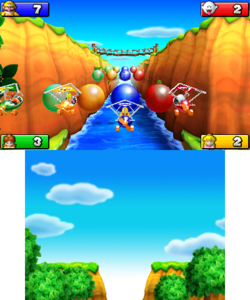 Slow Glide (known as Balloon Glider in PAL Regions) is a General minigame from Mario Party: Island Tour. The minigame's name, like in Snow Ride, is a pun on a song, "Slow Ride". The four players glide through the air and pop balloons. The game starts. This minigame has four players on gliders, flying through the air and popping balloons that are the same color of their glider. Each balloon is worth 1 point, but sometimes yellow balloons with a 3 on them appear, moving up and down, that give the player 3 points. Whoever has the most points at the end of the minigame wins. Rules – NA - "Aim for the balloons, and pop as many as you can. If the gameplay becomes unstable, place the system on a flat surface to recalibrate. You can also press down on at any time to reset the sensor position to normal." Rules – PAL - "Take to the air and pop as many balloons as you can. Note: Press down on to recalibrate the gyro sensor. If the in-game movements appear to be stilted, place the system somewhere stable and keep it still for a short time." This page was last edited on December 3, 2017, at 16:55.